For Severe Intestinal Discomfort & Bloating. 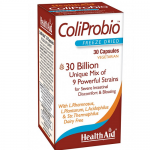 HealthAid Coliprobio combines the nine most researched live probiotics strains easily accessible for people who need a stronger support for intestinal & digestive health. 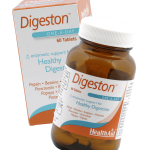 Chitosan Complex Capsules contain Chitosan, which is a non-digestible dietary fibre derived fromshell fish. It has an amazing ability to bind to fats; encapsulating them before they can be absorbed by the body and converting them into a non-digestible form. 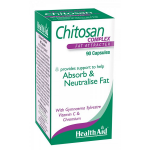 HealthAid Chitosan complex offers a unique combination of Vitamin C, Gymnaema Sylvestre Extract and Chromium which work synergistically to help speed up weight loss by helping to increase fat oxidation and suppress food cravings. Taken as part of a calorie controlled diet, and exercise regime, Chitosan Complex can help reduce unwanted fat and achieve optimal weight loss goals. Acidophilus (4 Billion) Capsules from HealthAid are formulated using special strains of probiotics cultures on a diary free medium. Fructo-Oligosaccharides help to support the growth and proliferation of bacterial strains in the intestinal tract. 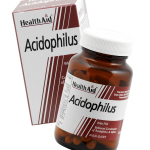 People using antibiotics, suffering from stomach discomfort, indigestion or persistent yeast infections such as Candida are well advised to include Acidophilus Plus from HealthAid as part of their daily regime. Acidophilus Plus Capsules from HealthAid are suitable for both vegans and vegetarians.